Who is behind Flux Jewelry Studio? Flux Jewelry Studio is owned and operated by Carly Cooke. Before starting her own business, Carly worked as a professional bench jeweler for many years, gaining knowledge and expertise through crafting and repairing beautiful jewelry pieces. She spent an inspiring year in Florence, Italy, taking classes in gemology, wax carving, jewelry rendering, and fabrication. Many of the unique engraved finishes and detail work Carly uses in her designs were passed down from the expert hands of jewelers working in the traditional Italian metalsmithing style. 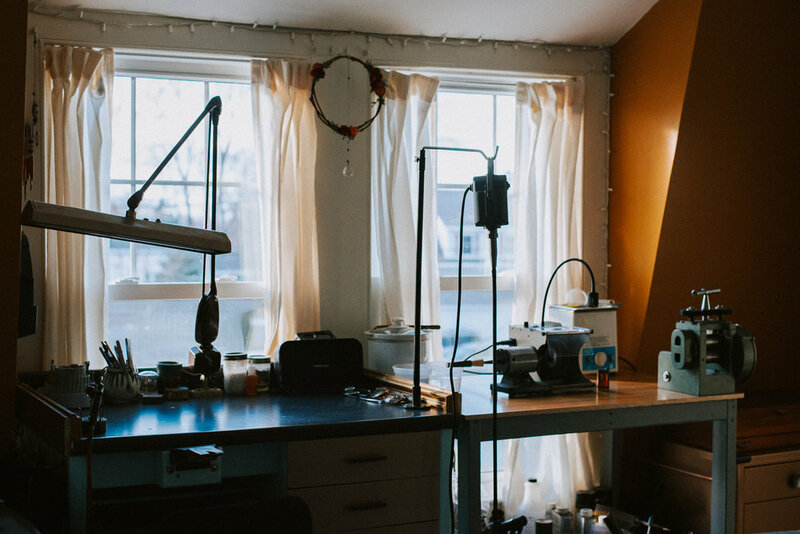 In her sunny studio on the coast of Maine, Carly spends hours twisting fine wires, forming small beads of metal, and engraving each piece. These small handmade details are what create a special heirloom quality in Carly's jewelry. Carly’s work can currently be found at Folia in Portland, Maine, and Devta Doolan Studio in Deer Isle, Maine.